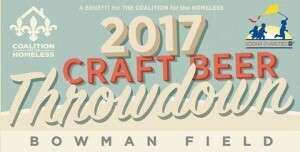 LOUISVILLE, Ky. (Aug. 28, 2017) — Six local breweries are doing their part to end youth homelessness in our community by competing in the 1 inaugural Craft Beer Throwdown on Thursday, Sept. 7. 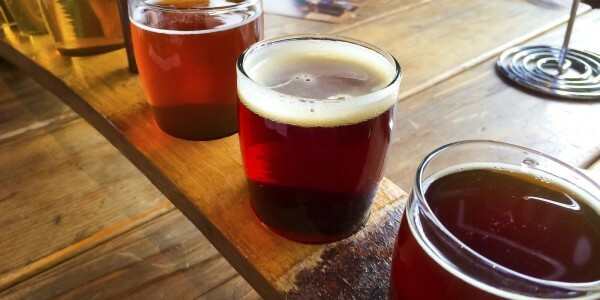 This new event is a benefit for the Coalition for the Homeless and will be held in the Louisville Executive Aviation hangar at Bowman Field from 6 p.m. – 10 p.m.
For a $20 online donation in advance or $25 at the door, attendees can taste six brews made exclusively for this event and vote for a winner. The winner will receive a custom-engraved mash paddle to display at their brewery and a year’s worth of bragging rights. • Falls City Brewing Company: “Y’all” – with a name that pays homage to our Kentucky roots, this beer is a bourbon barrel-aged chocolate pecan brown ale. • Great Flood Brewing Company: Citra IPA – a balanced and citrusy beer, orange in color, with aroma of mango, orange, lime, and lemon through Citra hop dry-hopping. It also features notes of caramel by its malt bill. • Holsopple Brewing – a Northeast IPA with a creamy yellow appearance created by interactions between hops, oat lipids, and yeast. The aroma contains hints of lemon and orange zest followed by a slight earthy pine. The oats provide a full-mouth feel while allowing the hop flavors to remain the focus throughout the sip. • Monnik Beer Company – “Never Be Gold” – a brandy barrel-aged barleywine aged in a Copper & Kings brandy barrel for one year. • Mile Wide Brewing – “Tuck Rule” – a soft and juicy Northeast-Style IPA, dry-hopped with Citra and Amarillo hops. • Against the Grain Brewery will be competing with a surprise beer, because they like to keep people guessing! The breweries will also sell some of their regular offerings at the event, with $1 of every beer sold being donated to the Coalition for the Homeless. Guests can also enjoy food from Steel City Pops, Zoom Zoom Yum, and Moe-licious BBQ, with 10% of sales going back to the Coalition. Carpooling is encouraged because parking is limited, and new Lyft users can get $5 off their first ride with the code: COALITION17. The inaugural Craft Beer Throwdown is presented by Kosair Charities. To purchase tickets or get more information about the efforts of the Coalition for the Homeless in Louisville, visit www.louhomeless.org or call (502) 636-9550.